I’ve only read The Great God Pan and the one where the guy turns into jello (White Powder?). I should read more, partly because I remember Lovecraft praising Machen to the skies in his essay Supernatural Horror in Literature. S.T. Joshi also thinks Machen is top notch. Has any of his stuff been adapted for film or television? Surprisingly, it looks like there are only a handful of Machen TV adaptations – of what quality is unclear. Of the stories I’ve read that you haven’t, I’d recommend “The White People”! I found it haunting and more lyrical. Do you remember your impression of “Great God Pan”? 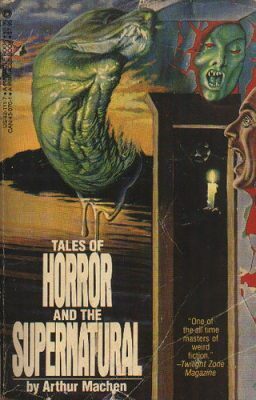 I think the only other Lovecraft tale where somebody gets squishy is “Cool Air”. My memory of “The Great God Pan” is fading, but I was impressed by it. Yes! Good call. Proper refrigeration saves unlives!